SkipperSeil Limited participated in Elecrama 2018 at India Expo Mart in Greater Noida from March 10-14, 2018. ​Skipper showcased its wide array of electrical products and solutions in large stall space. Speaking about Skipper’s participation in the event, President – Corporate EPC, Mr. S. K. Negi, said, Elecrama provides an outstanding platform for equipment manufacturers to showcase their latest product offerings to relevant audience. Skipper was honored to have many dignitaries visit at its stand. From Nigeria Hon. Mustapha B. Shehuri, Minister of State for Power & many directors from ministry of power, from Ghana Hon. William Owuraku Aidoo-Deputy Minister & many directors from ministry of Energy, from Nepal Mr. Kul Man Ghising, MD-Nepal Electricity Authority & his team were few to count. Moreover Leading power sector entrepreneurs ie Mr. Anil Gupta (CMD-KEI), Mr. Rishi Khanna (MD-CS Electric), Mr. T. P. Kabra (MD-RR Kabel), Mr. A.K. Gupta (Group President- Gupta Power Infrastructure). 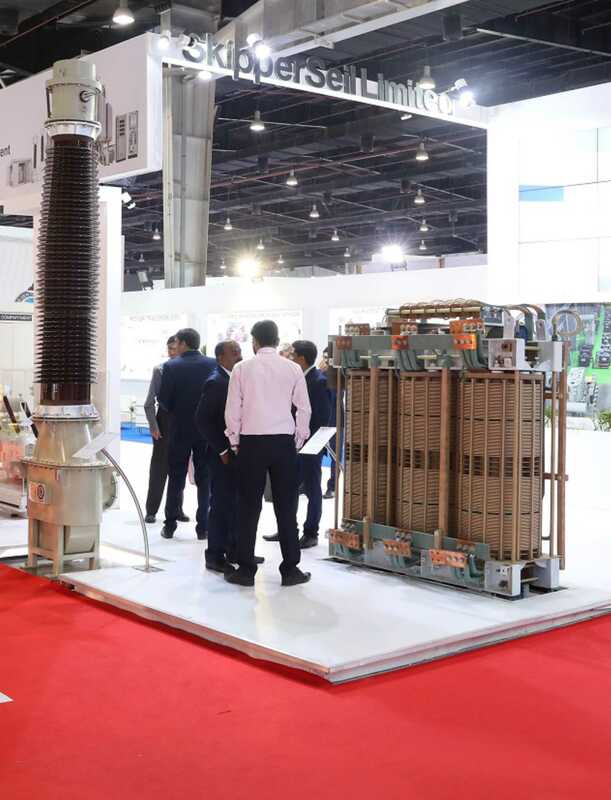 All the Visitors got a chance to view Skipper's world-class products at Display including Solar Transformer, Package Substation, Current Transformer, Metering Panel and Miniature model of 500 MVA, 400/220/33kV, 3 Phase Auto transformer under supply to GETCO. Skipper also hosted a Gala Dinner on 11th March in Hotel Crowne Plaza, Greater Noida. The dinner was attended by Skipper's Directors arrived across boarders and many prestigious customers from Nigeria, Ghana, Benin, Kenya, India, Sri Lanka, Nepal, Europe & Americas. It was a fantastic event enjoyed by all and a great networking opportunity for all participants.